"Despite the traditional hoarse voice, rough appearance, and quarrelsome tone, cab-drivers are as a rule reliable and honest men, who can boast of having fought the battle of life in an earnest, persevering, and creditable manner. Let me take, for instance, the career, as related by himself, of the cab-driver who furnishes the subject of the accompanying illustration. He began life in the humble capacity of pot-boy in his uncle's public-house, but abandoned this opening in consequence of a dispute, and ultimately obtained an engagement as conductor from the Metropolitan Tramway Company. In this employment the primary education he had enjoyed while young served him to good purpose, and he was soon promoted to the post of time-keeper. 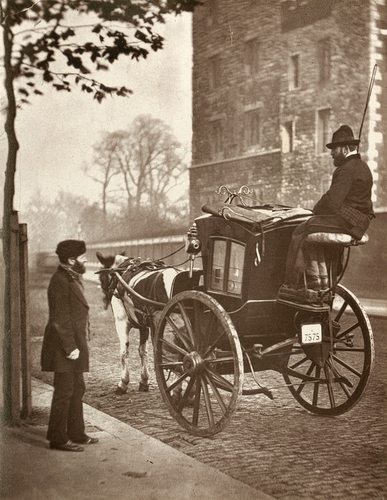 After some two years' careful saving he collected sufficient money to buy a horse, hire a cab, and obtain his licence."